Android Wear 2.0 is here, and the massive update brings a host of welcome new features to Google’s wearable operating system. This is a thorough OS overhaul, one that gives Android Wear a cleaner look and feel, boosts the user experience and, most crucial of all, finally creates a true Apple Watch rival. The best of Android Wear 2.0 is showcased in two smartwatches built by LG. 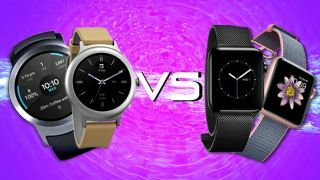 The LG Watch Style and LG Watch Sport are the fruits of a close collaboration between LG and Google, one where, as Android Wear project manager Jeff Chang told TechRadar, the hardware influenced the software, and vice versa. With a reinvigorated OS and two solid devices that feature its best bits, Android Wear is finally poised to take on Apple Watch. Here are three reasons why. The LG Watch Style is the thinnest Android Wear watch ever, addressing one of the most vociferous complaints about devices running the OS - they are big and bulky. At 10.8mm thin, the LG Watch Style is a touch slimmer than the Apple Watch Series 2, yet stretches to the same 42mm width as the larger version. We’re talking the difference of a millimeter here, so it’s not like the Apple Watch suddenly looks like a hulking chunk of metal next to the Watch Style, but the latter marks a new chapter in the Android Wear story, one that now includes the option to buy a smaller watch on the same scale as Apple’s wearable. By going thin, Android Wear 2.0 can truly challenge the Apple Watch for wrist real estate. Shoppers turned off by bulkier smartwatch sizes can now cast their gaze past Apple's wearable to get a device they desire. The LG Watch Style won’t be the last thin Android Wear 2.0 watch, but as the first, it presents an instant challenge to Apple Watch. The device is the first Android Wear 2.0 watch to feature LTE, Google says, letting you stay connected free from your phone. The LG Watch Urbane 2nd Edition LTE had, as the name suggests, LTE connectivity, but it didn’t run Android Wear 2.0. It was hardly a success either, having been delayed five months before a less-than-spectacular launch. This was not the Android Wear LTE watch you wanted. Apple may introduce LTE in the Apple Watch 3, but that won’t be out until later in 2017 or even 2018. Google and LG have beat Apple to the punch when it comes to LTE - again - and will enjoy owning those bragging rights for at least a few more months. The final arrow in Android Wear 2.0’s quiver is price - the LG Watch Style costs $249 and the LG Watch Sport is priced at $369. Both go on sale February 10, the same day the software releases to the public as well. With the sub-$400 LG Watch Sport, Android Wear 2.0 already has an LTE watch that won’t buckle shoppers’ wallets. Apple might try to match this, though again, we don’t expect an LTE variant of its proprietary wearable to be what anyone would call inexpensive. Fully loaded devices that give you a ton for your money, leading LTE connectivity and the slimmest size choice yet all set Android Wear up as a legitimate Apple Watch rival. Google has put its best hardware and software forward at the launch of Android Wear 2.0. Now, it's Apple's turn to respond.